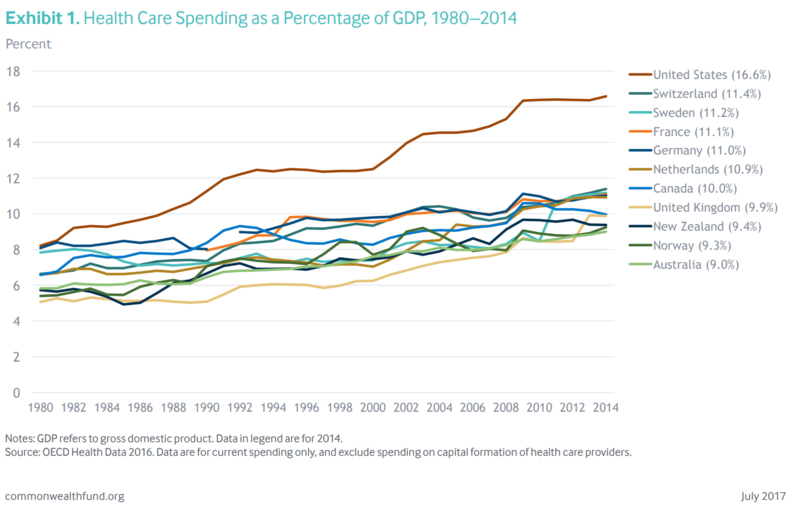 Anyone who can rub two brain cells together knows America spends more, much more, on health care than any other developed nation, as this chart from the Organization for Economic and Cooperative Development (OECD) shows. Also well established is the sad fact that in terms of health care outcomes our brethren in the OECD – Canada, England, Germany and France, for example – fare better than we. 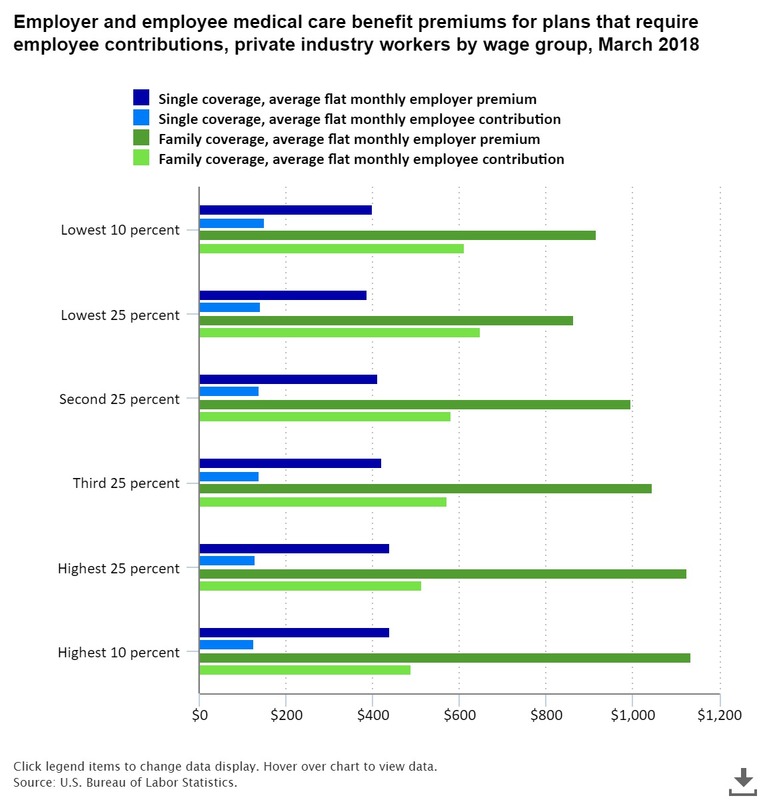 Now, recent data published by the Bureau of Labor Statistics show lower wage workers pay more for health insurance than higher wage workers in employer provided plans. 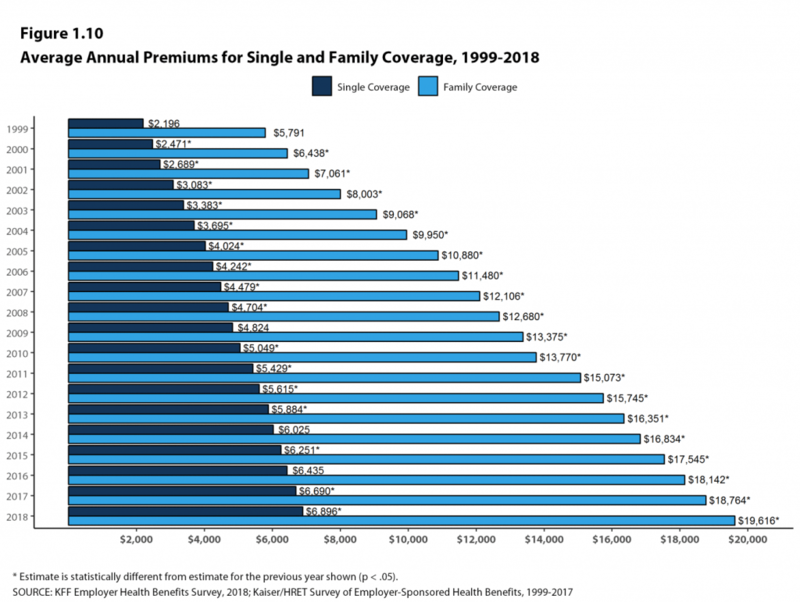 What this means is: The employee portion of the monthly premium for family coverage paid by the lowest 10% of earners is $612, while the monthly premium for the highest 10% is $488. 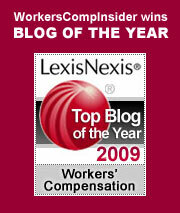 The lowest 10% of earners pay 25% more than the highest 10%. Similar results for single coverage. Look at the light blue and light green bars in each of the strata in the chart. The more you make, the less you pay. This is wacky. And terribly unfair. But wait, there’s more. For every year in the 21st century, this has been getting worse. From 2000 through 2018, health insurance costs for a single person in an employer-provided health plan rose 179%; family coverage rose 204%. During this same period, the Consumer Price Index was up 49%, while earnings for hourly employees grew by 48%. So, essentially, workers’ pay matched inflation, meaning real wages, wages adjusted for inflation, did not move as health care costs continued their rocket ride to the moon. I keep thinking this cannot continue. I keep thinking Herb Stein was right: If something cannot go on forever, it will stop. And I keep being proven wrong. The fact is, up until the mid-1980s, our health care system was like a typical family home with its two bedrooms, a bath and a half and a nice little two-car garage. Today, it seems like the 1,000-room, maze-like Windsor castle where you need a map and a guide to find your way around. Vested interests litter the landscape, and any change gores somebody’s ox. How can we possibly stop this runaway train? Many placed hope in the Affordable Care Act, but look what’s happened to that. The new generation of Democrats yearns for “Medicare For All,” but has yet to figure out how to pay for it. Others suggest “Medicaid For All,” but Medicaid is a state-based system, and every state has its own version. I’d love to see a single payer system, but, looking at the lunacy behind our current government shutdown, can you envision that cresting over the horizon, given all the work and bi-partisanship it would take? When I look at the health care horizon, I see the Four Horsemen of the Apocalypse coming over the rise. Certainly, there are pockets of innovation and excellence around the nation, but we have no national, systemic approach to fix to the problem of extraordinary high costs, and it’s hard to imagine this congress, or any congress, doing anything about that. At more than $8 billion dollars, the health care industry spends more on lobbying than any other industry, and that’s not about to change, once again proving Mark Twain right: We have the best government money can buy. I believe the work done in those “pockets of excellence” will gradually lead to improved health for Americans who can afford to pay for it. It’s the “can afford to pay for it” part that sickens me. This entry was posted on Monday, January 21st, 2019 at 9:24 am	and is filed under health care, Research. You can follow any responses to this entry through the RSS 2.0 feed. Both comments and pings are currently closed.